Traditionally the term “caviar” refers to roe from wild sturgeon in the Caspian and Black Sea. The four main types of caviar are Sevruga, Ossetra, Sterlet, and Beluga. 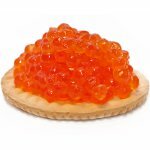 However, the word “caviar” is also often used to describe the roe of other fish such as trout, steelhead trout, salmon, whitefish, lumpfish. True caviar is typically black, but there are also red and orange varieties. Its color depends on the species of fish. Caviar is rich in vitamin B12 but it is also high in cholesterol. Fresh (non-pasteurized) caviar is extremely perishable and is kept refrigerated until consumption. Pasteurized caviar is less perishable. The world's largest producers and exporters of caviar are Iran and Russia. Other large producers and exporters include the United States, Canada, Uruguay, Italy, Spain, and Saudi Arabia. Caviar is quite an expensive delicacy and very few people can afford to eat it regularly. This is what National Caviar Day is for. On this day, you are allowed to splurge and indulge yourself with any variety of caviar you can find at specialty food stores or in a local seafood restaurant.